Uplands, meadows & pollinator projects are great for a variety of site types. Upland sites are characterized as being dry most of the year. Soils at these sites are well drained and may consist of sandy clay, sandy loam, loam or shale. The topsoil layer may be thin and subject to drought. If yours is a sandy site, refer to the Southeastern U.S. Sites Planting Guide. Upland examples include naturally rocky soil that has been subject to erosion or steep road cuts. 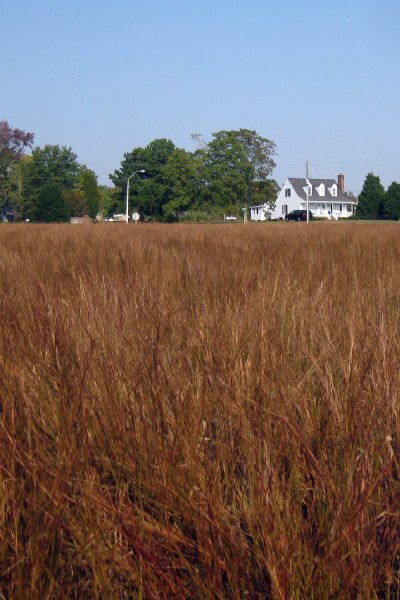 Meadow examples include abandoned farm fields, previous lawns, vacant land or roadsides. Typically in full sun for at least half the day with good air circulation; generally occupied with UPL, FACU and FAC species. Natural fertility is usually adequate; fertilizer and lime are not needed (fertilizer often helps weeds and invasives). Check your soil pH and select species adapted to that pH. Hand seed, broadcast seed, hydroseed or drill seed. If your site was previously a lawn or crop field to which herbicides were applied, it is important that you allow the appropriate interval for the residues of those herbicides to break down prior to planting your meadow. Some herbicide residues can prevent seedling germination. Competition from invasive or undesirable vegetation is the most limiting factor in upland meadow preparation. Prior to planting, all such vegetation must be fully controlled. Typical control strategies include repeated tilling, smothering with black plastic or herbicides. When using the tillage strategy, a site is disc harrowed every two to four weeks for a one to two month period. The underlying premise of this process is that the root system of perennial species will be worn out to the point of killing the species. In addition, tillage will stimulate germination of dormant weed seed Which will be killed by subsequent tillage. 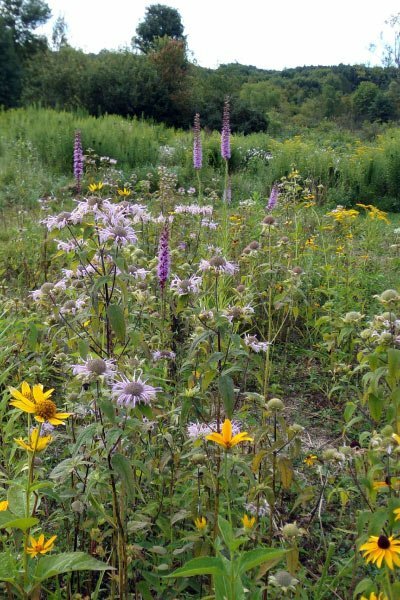 Planting should not occur until perennial species are completely killed. Black plastic may also be used to kill weeds. It may be laid across tilled or untilled soil and anchored down by burying the edges in soil or laying boards or bricks across the surface. This protocol should be utilized during a growing season where the intent is to fall plant in the same year or spring plant the following year. The application of an approved herbicide, such as glyphosate (Roundup® or Rodeo®), is the most common and least time-intensive protocol for controlling existing vegetation. Herbicides are most effective on actively rowing plant tissues; therefore, they are very effective on new growth in the spring. Spraying should begin when growth is approximately 6” high. One to two weeks later, a follow-up application of spray may be made To address skips or persistent species. If substantial plant tissues remain on the surface following a full kill by herbicides, a close mowing, tillage or burning may be necessary to achieve good seed-to-soil contact. 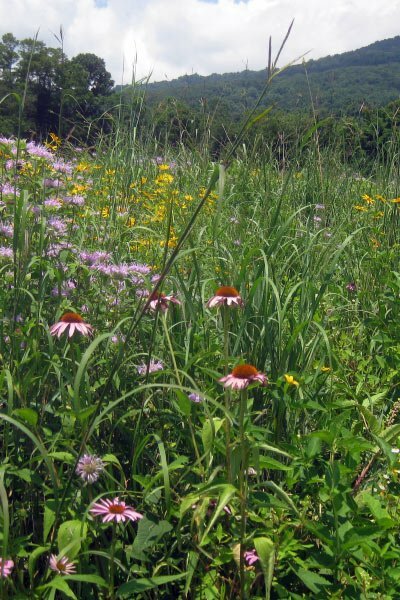 Whenever canopy (overall vegetation) reaches a height of 18”- trim the meadow to a height of 8” (Note: A lawn mower is not recommended as the mower height will be too low and native seedlings will be killed). This will reduce competition by fast-growing weeds for sunlight, water and nutrients needed by slow-growing perennial natives. Mowing should cease by mid-September. For seedings of annual wildflower mixes or annual & perennial wildflower mixes, problem weeds should be hand pulled. Problem weeds should be hand pulled or spot sprayed with approved herbicides (such as Roundup® or Rodeo®). For additional helpful information, please reference our Guide to the Life Cycle of a Meadow. The following mixes are used in full sun with well-drained soils and provide food and/or cover for Wildlife. 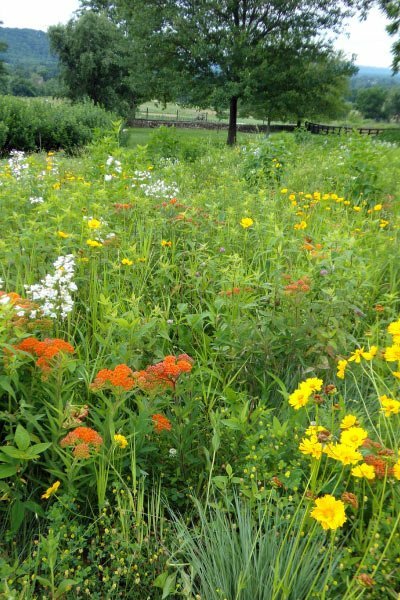 Meadow and wildflower mixes provide food for insects, including native pollinators.